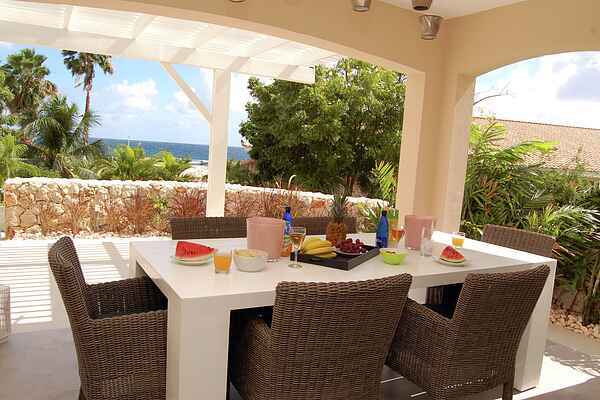 Apartment Kalki is a beautiful accommodation on one of the hotspots of Curaçao; near the Sea Aquarium - Mambo Beach. The apartment has two bedrooms and two bathrooms. From the porch you have a view of the sea. The resort also offers you a communal pool and private beach. This corner apartment, located on the ground floor, is part of a new, small-scale apartment complex on Curaçao. The living room is decorated in a Caribbean style, and lies adjacent to the spacious terrace. You can reach Kalki's terrace via the large sliding doors. On the terrace with sea view you'll find a lovely large lounge bed. When you return from a dive in the pool or in the sea, you can rinse yourself off in the outdoor shower. Willemstad is the capital of Curaçao. The city district includes several neighbourhoods of which Punda and Otrabanda are the main parts of the town. Whoever sees a website about Curaçao, will undoubtedly see a photo of the Handelskade. The eastern harbour district of the St Anna Bay is filled with Old Dutch facades. Behind the Harbour is the shopping district of the city.